With a stay at Baymont by Wyndham Greenville in Greenville, you'll be within a 15-minute drive of Vidant Medical Center and East Carolina University. 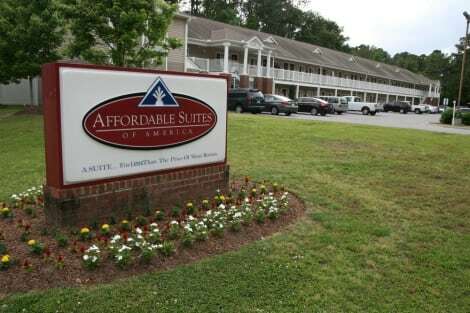 This hotel is 3.5 mi (5.6 km) from Dowdy–Ficklen Stadium and 3.9 mi (6.2 km) from Greenville VA Medical Center. Make yourself at home in one of the 43 air-conditioned rooms featuring kitchens with refrigerators and stovetops. Complimentary wired and wireless Internet access keeps you connected, and cable programming provides entertainment. Conveniences include desks and microwaves, as well as phones with free local calls. Satisfy your appetite at Dennys across the street, one of the hotel's 3 restaurants. A complimentary buffet breakfast is included. lastminute.com has a fantastic range of hotels in Greenville, with everything from cheap hotels to luxurious five star accommodation available. We like to live up to our last minute name so remember you can book any one of our excellent Greenville hotels up until midnight and stay the same night.